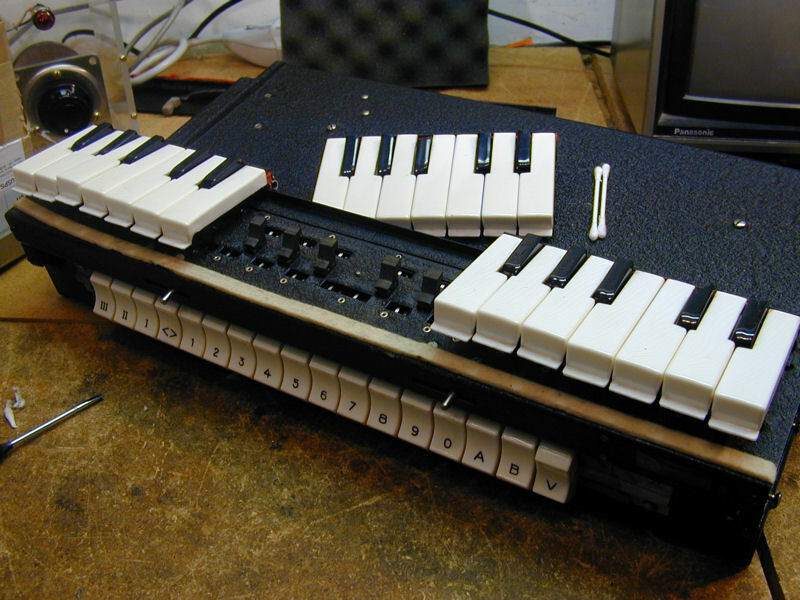 The Clavioline is an early electronic keyboard instrument, similar to my Hammond Solovox. 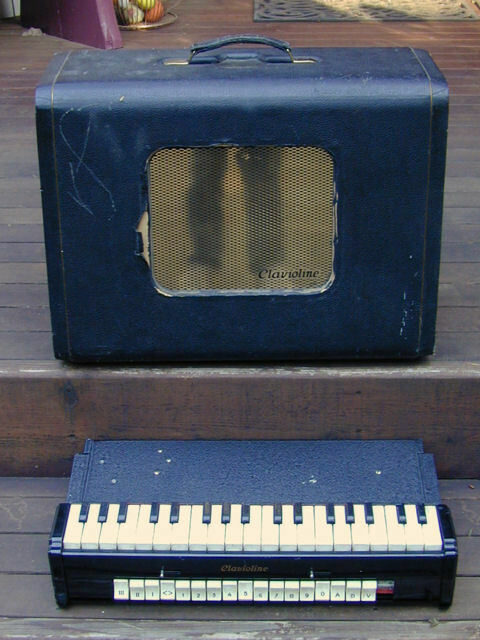 Both of them are monophonic (single voiced) and tube powered, consisting of a keyboard and an amplifier. The first photo shows my Clavioline after restoration. In the second photo, my son, Peter, is seated at the keyboard. Click the musical icon to hear him playing a brief theme from the well known 1962 song, Telstar. 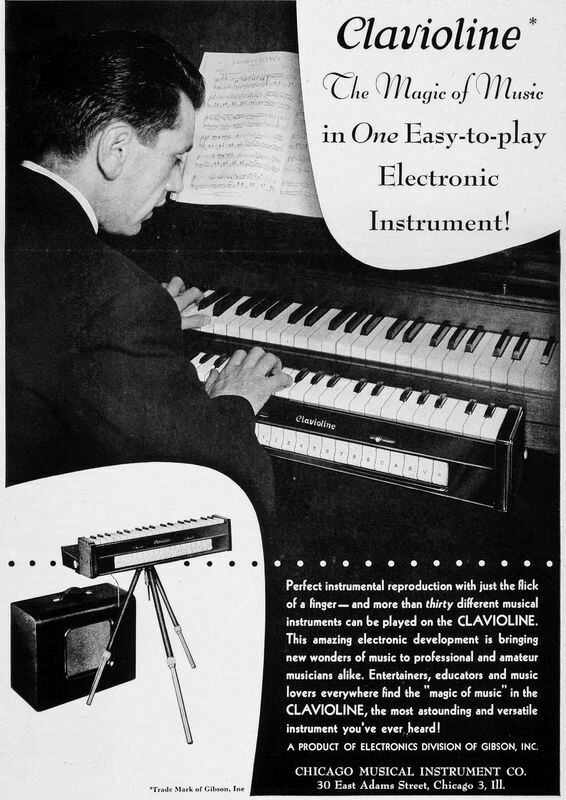 My Clavioline is a Gibson, shown here in some mid-1950s ads. As illustrated, a Clavioline can be used in two ways. 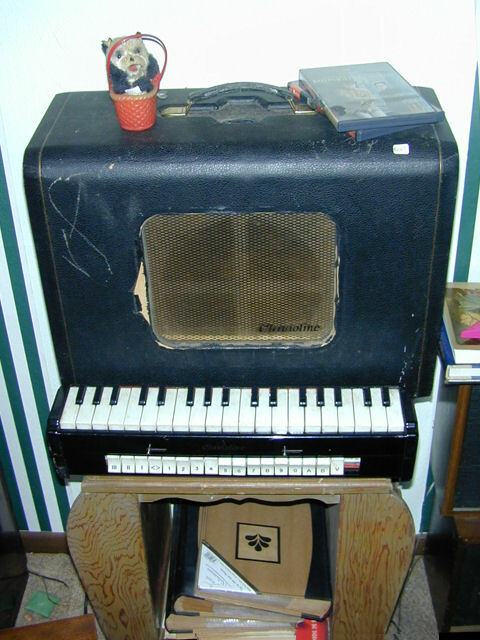 First, like a Hammond Solovox, it can be mounted on a piano and played as an adjunct to the piano keyboard. 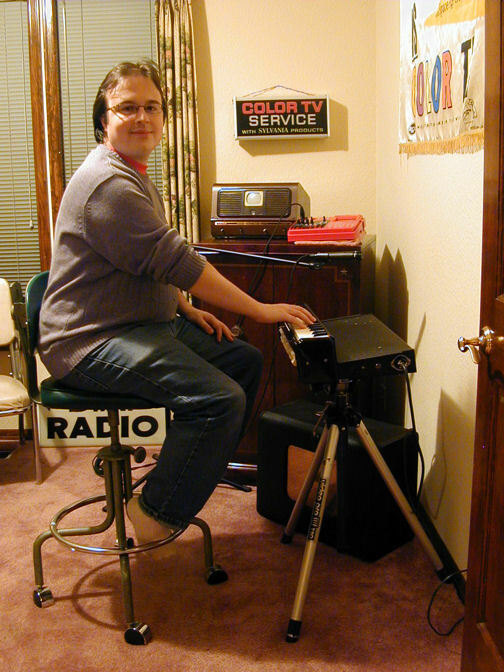 Or, mounted on a tripod, it can be played as a standalone instrument. Either way, the artist must be sitting, in order to operate the knee-lever volume control, or "expression" control, as termed in Clavioline literature. In the United States, Claviolines were manufactured by the Gibson instrument company. They were also built by Jörgensen in Germany and Selmer in England. Since the Jörgensen and Selmer instruments differ in construction as well as features, I'll refer you to the previous links for details about them. If you're looking for a layman's explanation of how a Clavioline works, the patent is not the place to start. Like most patents, it is written in a dense polyglot of legalese and techno-jargon, aimed at establishing precedence and forestalling infringement. Furthermore, since a patent is drafted to protect ideas and principles in the broadest possible fashion, this one doesn't literally describe the Clavioline as it was commercially realized. Still, it's interesting to see a contemporary expression of Martin's idea. 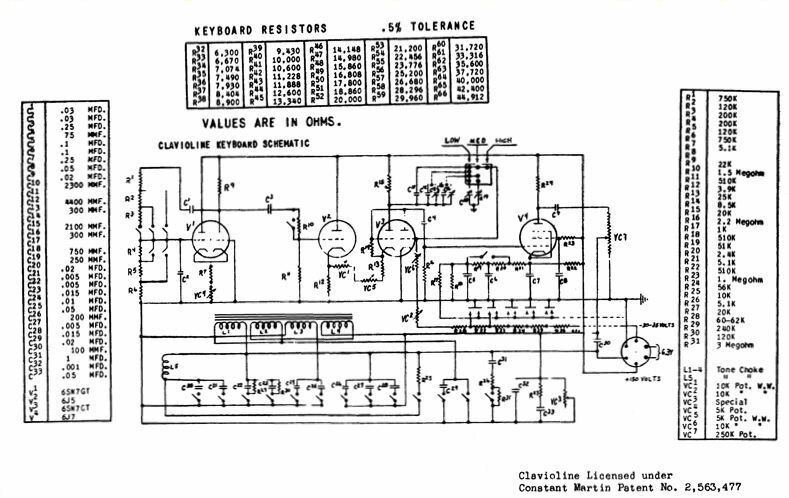 Interestingly, the last page of Martin's patent description references an earlier (1939) patent, number 2233258, "Electrical Musical Instrument." 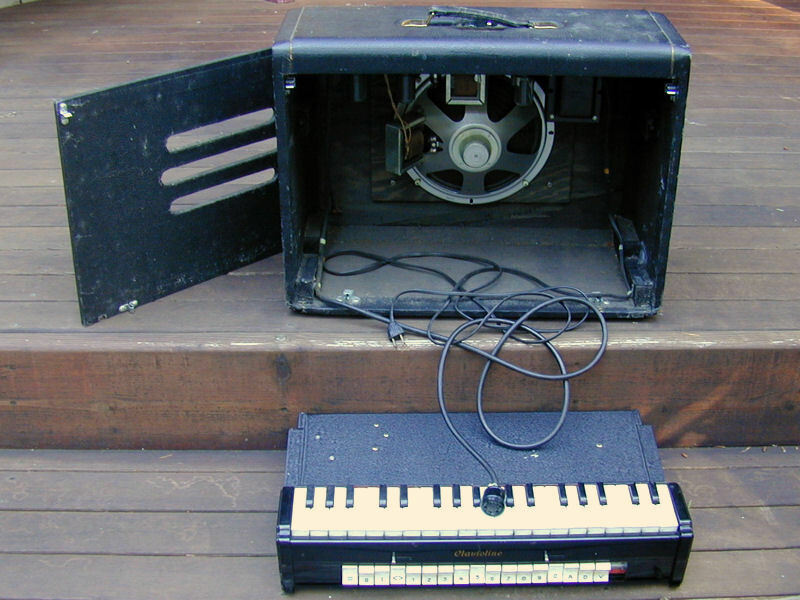 Held by Laurens Hammond and John Hanert, that is the seminal patent for the Hammond Solovox. Some long winter's evening, I'll need to sit down and compare the circuitry of these two similar instruments and decide how different they really are. 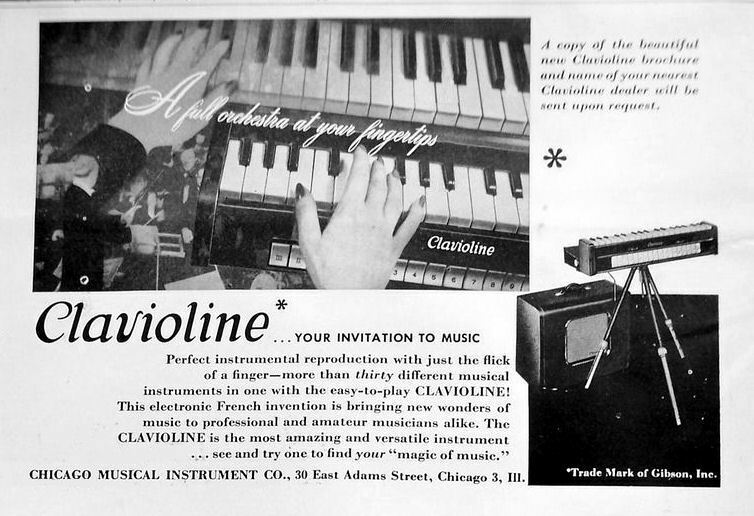 The Clavioline has more voices and a larger octave range, but presumably more than that was needed to establish that it wasn't merely a rehash of the earlier Solovox design. Apologies for the low quality of these schematics. 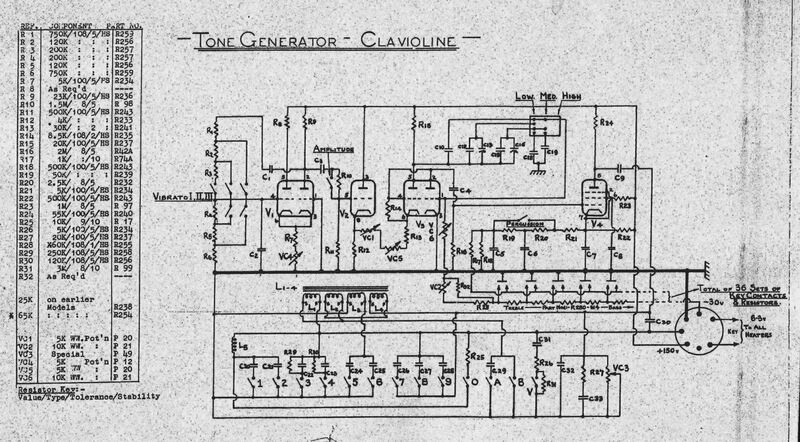 If you have a more detailed Gibson service manual, or even clearer copies of these schematics, please contact me. I found this Clavioline at a crowded estate sale in 2011. 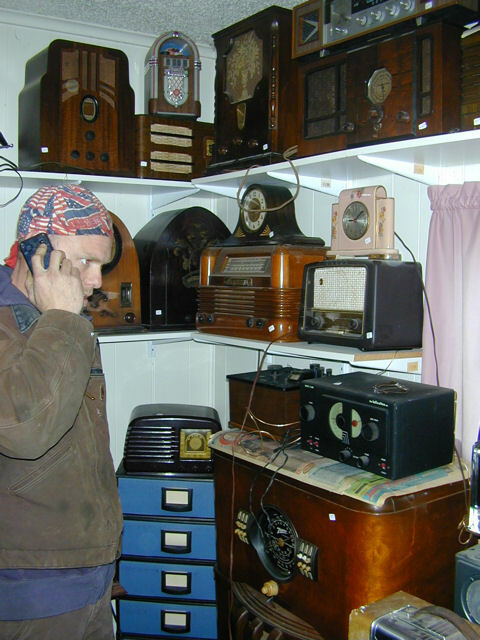 The sale was located in a tiny house, whose every room was crammed to the ceiling with shelves for antique radios and other electronics. The fellow in this photo was on the phone, describing every radio in the house to someone on the other end. I didn't see any radios or TVs that I wanted, but this little keyboard caught my eye. 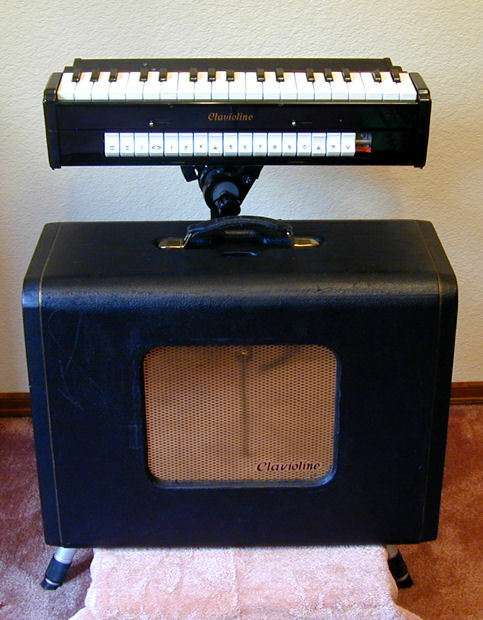 I recognized the name Clavioline as a monophonic instrument like my Solovox. The price ($250) was too high to tempt me, but I returned the next day and made a deal for half that price. Here is my Clavioline after unloading back at home. 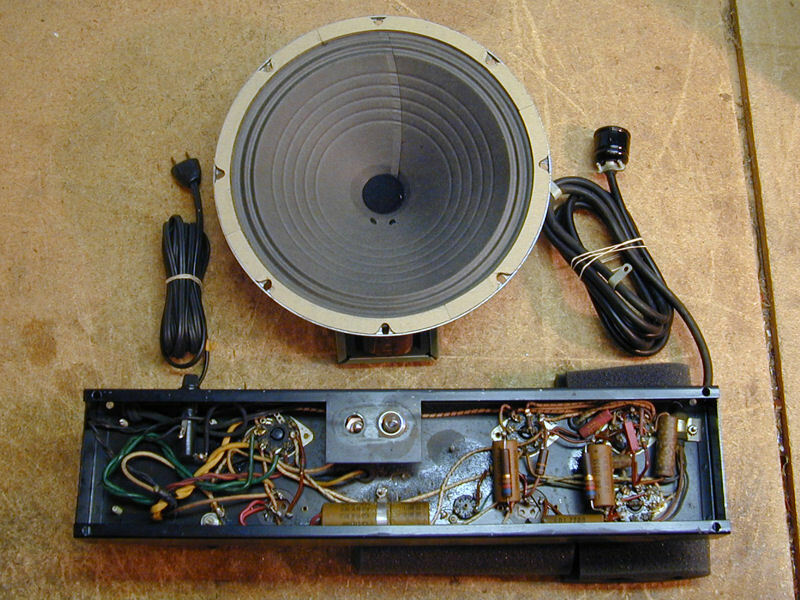 Removing the back cover reveals the speaker, power cord, connecting cable, and the power/amplifier chassis. To transport the Clavioline, you stow the keyboard unit in the back of the cabinet and pop the cover back on. 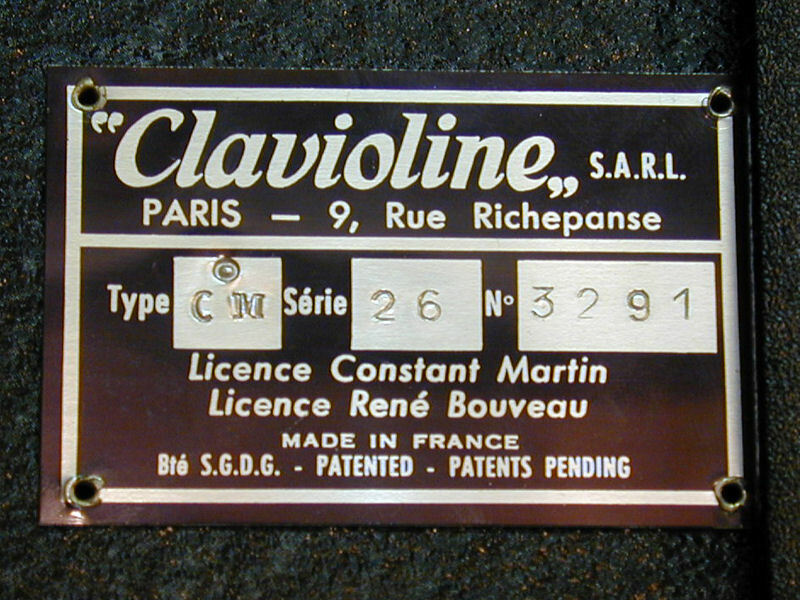 My Clavioline has no identifying information other than the ID plate shown earlier, which says Made in France. After a little research, I concluded that it's a Gibson model, sold under license in the United States. Since its components (capacitors and whatnot) are also of U.S. manufacture, I presume the whole thing was manufactured here, not imported as the ID plate suggests. 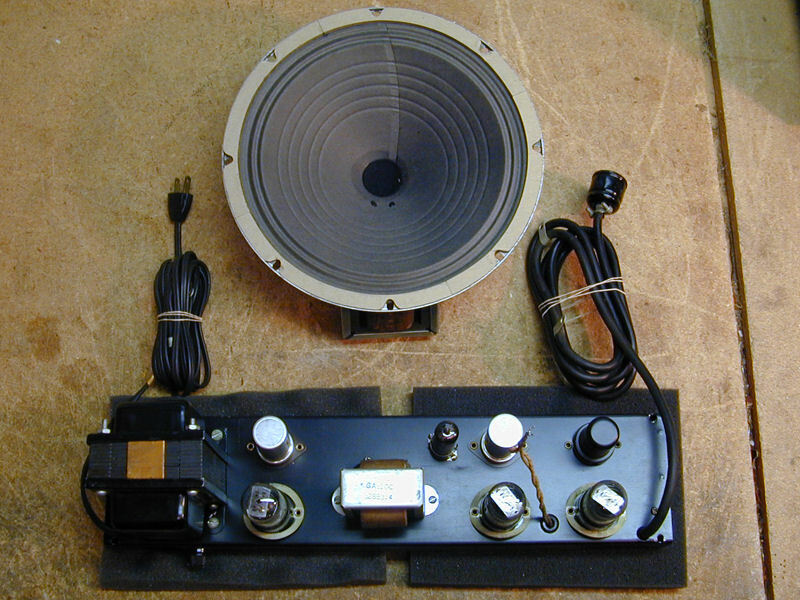 Some time later, I saw photos of an identical model with a sticker on the back of the speaker that said Gibson Ultrasonic. Perhaps mine once had the same sticker, but it fell off and became lost. Moving my Clavioline to the workshop, I cautiously powered it up, using my variac and watching its ammeter for excessive current draw. The Clavioline worked . . . sort of. I could hear notes from many of its keys, but they were sometimes intermittent. 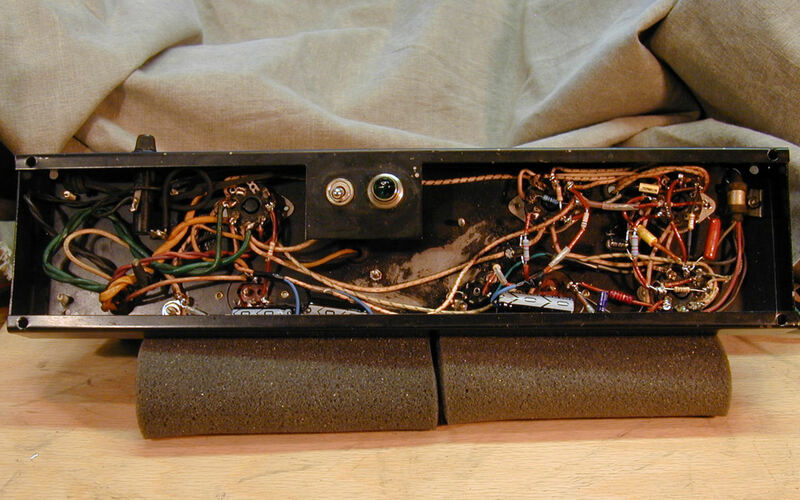 A few of the tone switches had an effect, but others seemed to do nothing, and the vibrato switches were also inoperative. 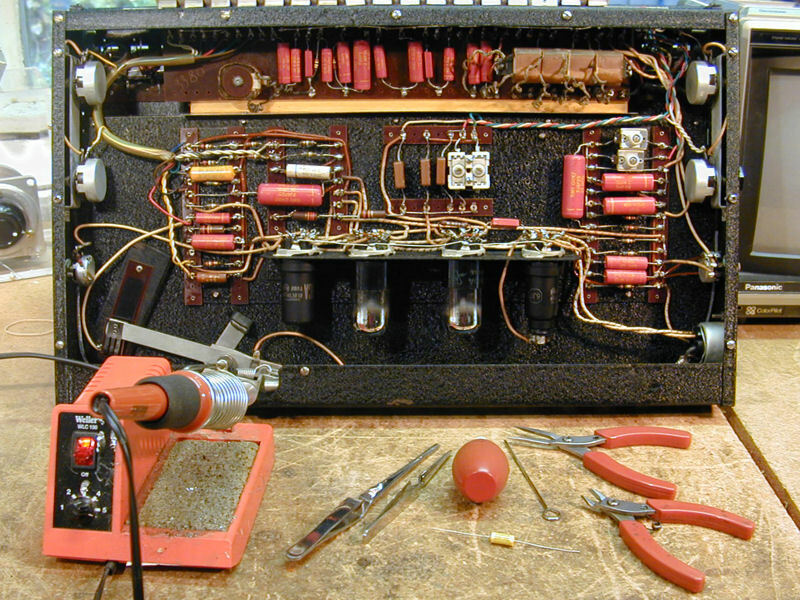 Not to worry, every 60-year old tube device needs service, chiefly in the form of new capacitors. It's not surprising that the keyswitches and controls need cleaning, too. 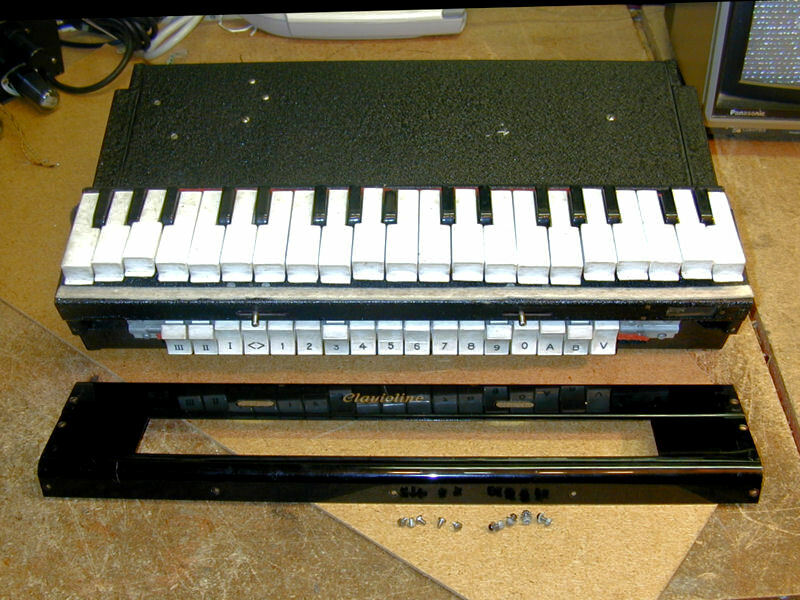 We'll examine the two Clavioline chassis separately, starting with the keyboard unit. 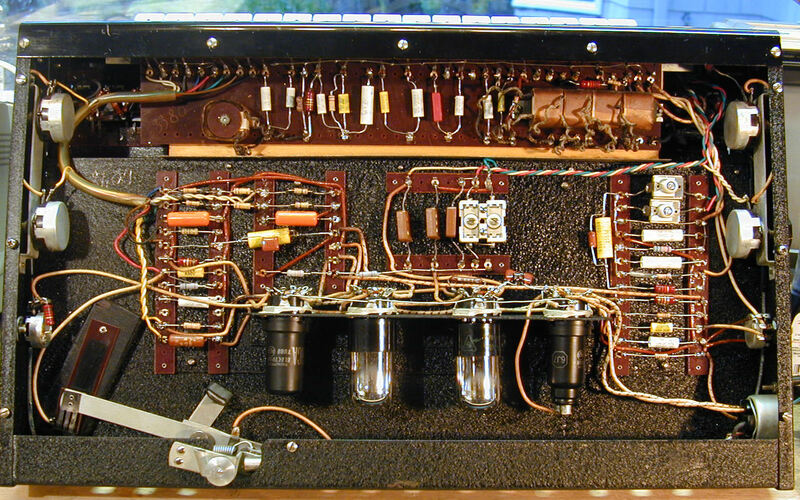 A Clavioline is not especially complex, compared to other tube electronics. A full restoration will take a number of hours, however, so don't expect to give yours a complete overhaul in an evening. By removing a few screws, you can take off the large cover plate on the bottom of the keyboard unit. 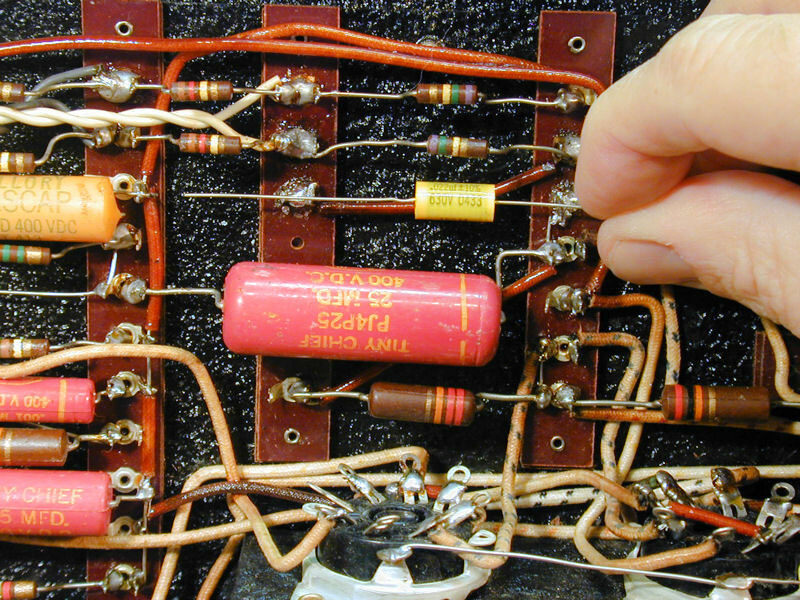 This exposes the tubes, potentiometers, and other electronic components. After removing those screws, I put them back into the holes they came from. This is a great way to avoid losing parts! 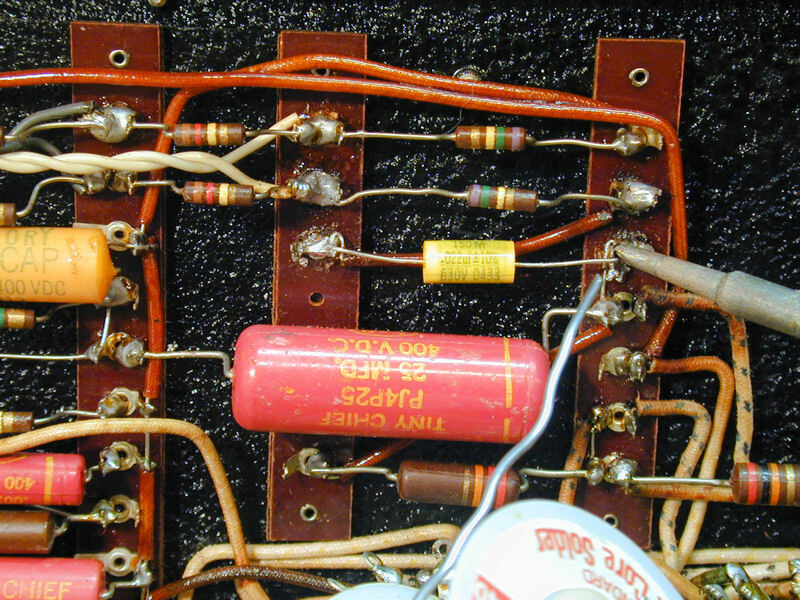 The pink tubular components are "Tiny Chief" brand plastic-coated paper capacitors. 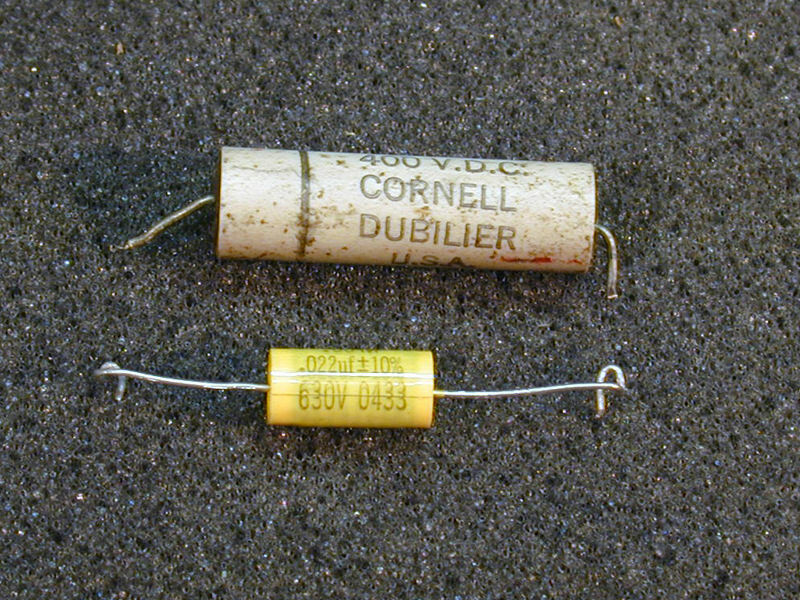 This type of capacitor is notoriously unreliable and should always be replaced, as explained in my recapping article. 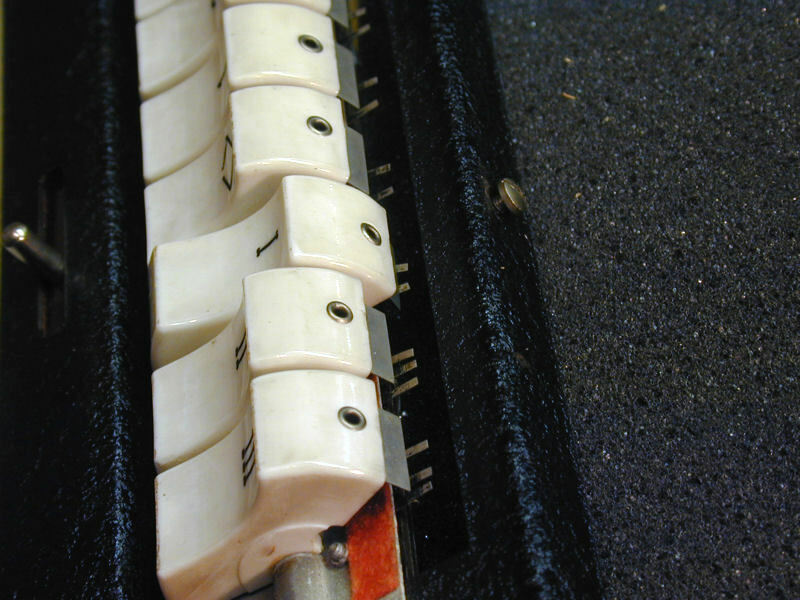 When you remove the front panel, all of the white keys will rise up a little on their springs, although they are still held on by screws from the back. 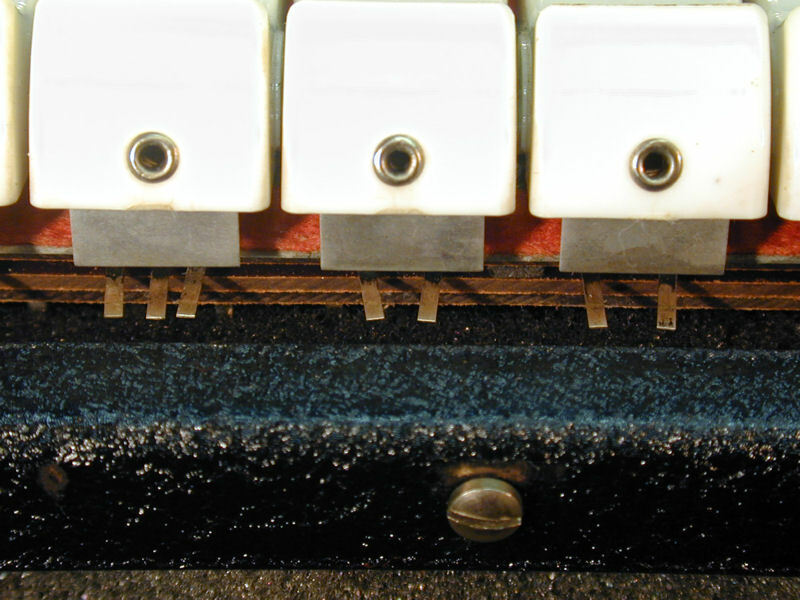 Removing the panel exposes the rocker-style control switches, which select tone combinations and vibrato effects. 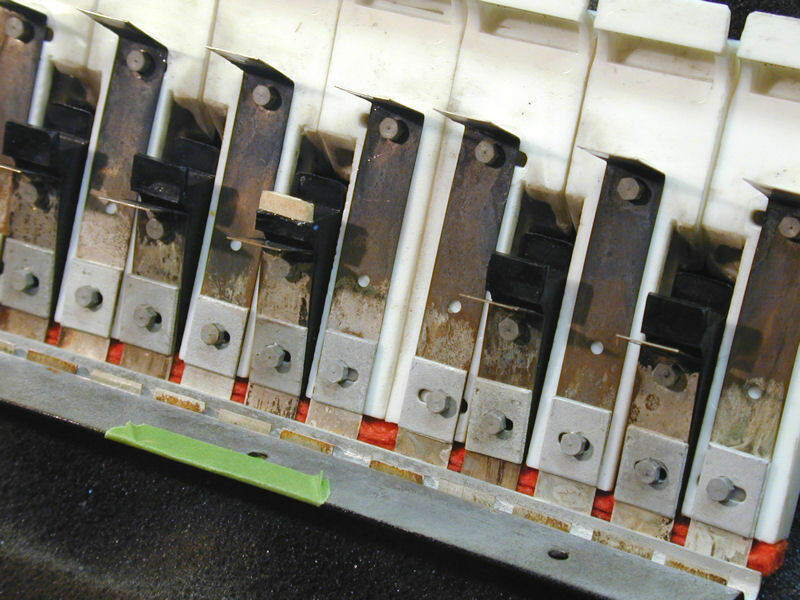 When a switch is toggled, its blade-shaped upper contact completes a circuit with two or three springy contacts below. As the photo shows, some of those contacts are dark with dirt and oxidation. 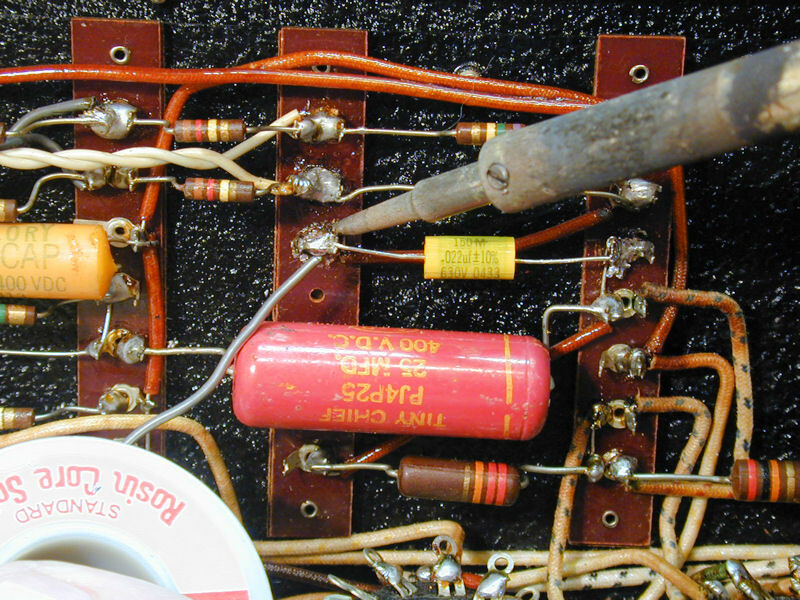 The control switches have either two or three springy contacts and the circuit is completed when the blade touches them, thus activating the tone filter or other components wired to the contacts. I'll clean the control contacts with Q-tips dipped in DeOxit D100L electronic cleaner. Don't press too hard on the contacts, lest you deform them. After wetting the Q-tip with DeOxit, I gently twirled it on each contact until the discoloration went away. You also need to clean the edge of each blade, of course. Here are three switches after some cleaning. The keyswitches are similarly constructed, but they are momentary-contact switches, completing the circuit only while you hold the key down. 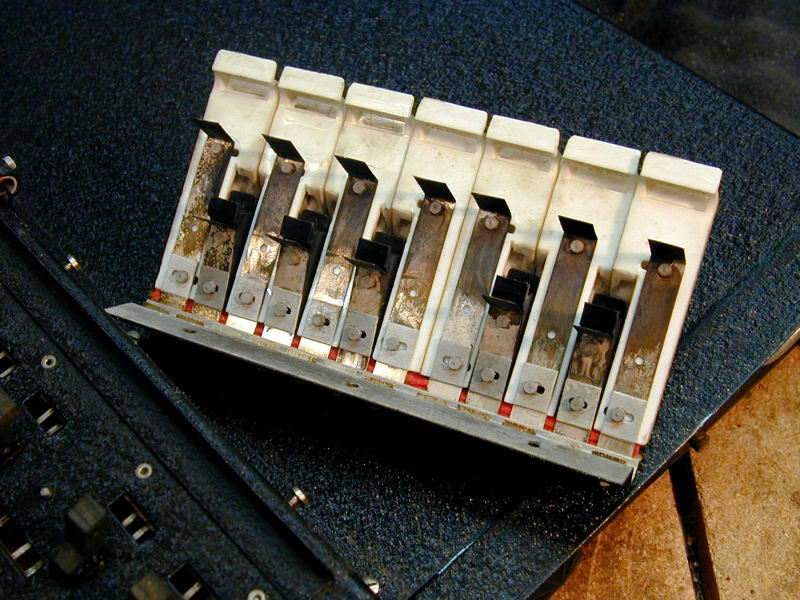 To clean them, you'll need to remove the switches, which come out in three banks, screwed on from behind. Each keyswitch has two springy contacts below, and every keyswitch blade is connected to chassis ground. Depressing the key grounds both contacts, with a very slight delay between touching the first and second contact. This ensures a clean attack for the note, without any electrical pops or clicks. As with the control switch contacts, I dipped a Q-tip in DeOxit and twirled it on each set of contacts to clean them. After finishing the first bank, I reinstalled it and proceeded to the second bank. The lip on one of the black keyswitches had broken and become lost. I cut a little piece from a popsicle stick and glued it on with epoxy. Not as beautiful as an original key, but now it works exactly the same! The next photo shows an important detail. 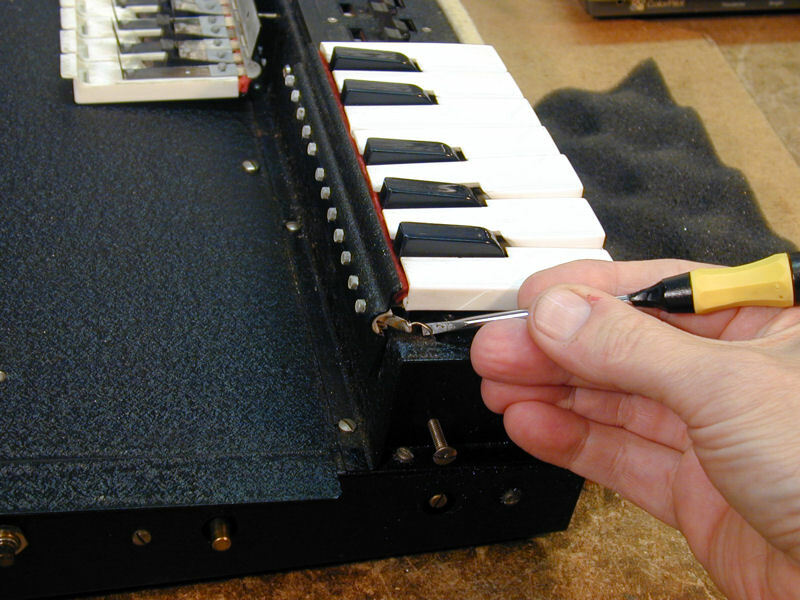 Before removing the third bank of keys, you must unsolder this wire, which connects every keyswitch to chassis ground. Solder this wire back in place when you reinstall the bank; a secure ground connection is critical for keyboard operation. Eventually, all of the keyswitches were clean and back in place. Recapping is a routine practice for every tube device from this era. Since this Clavioline article is likely to be read by non-radio folks, I'll describe the basic process in more detail than usual. This photo shows the keyboard chassis and the tools that I'll use: a soldering iron, wire cutter, needlenose pliers, bulb solder sucker, and a couple of steel tweezers. 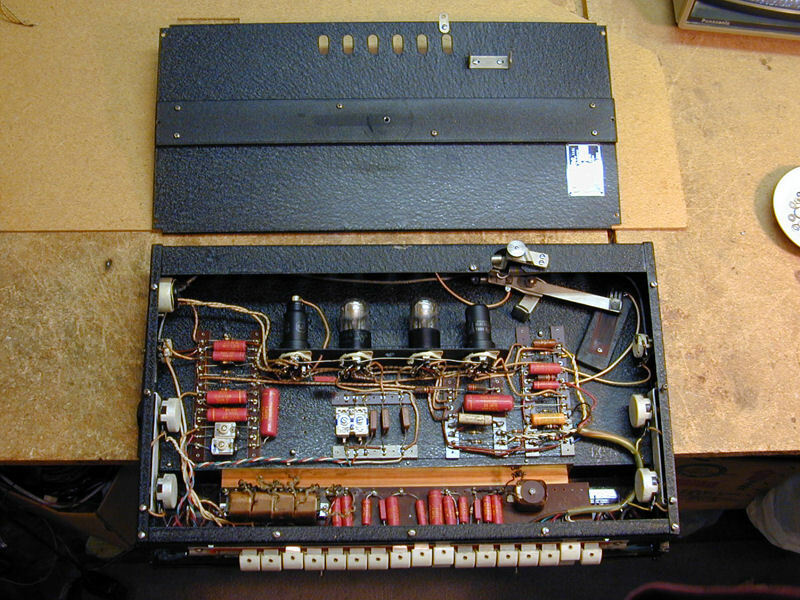 The Clavioline chassis is easy to work on, compared to most radios and TVs of the era. 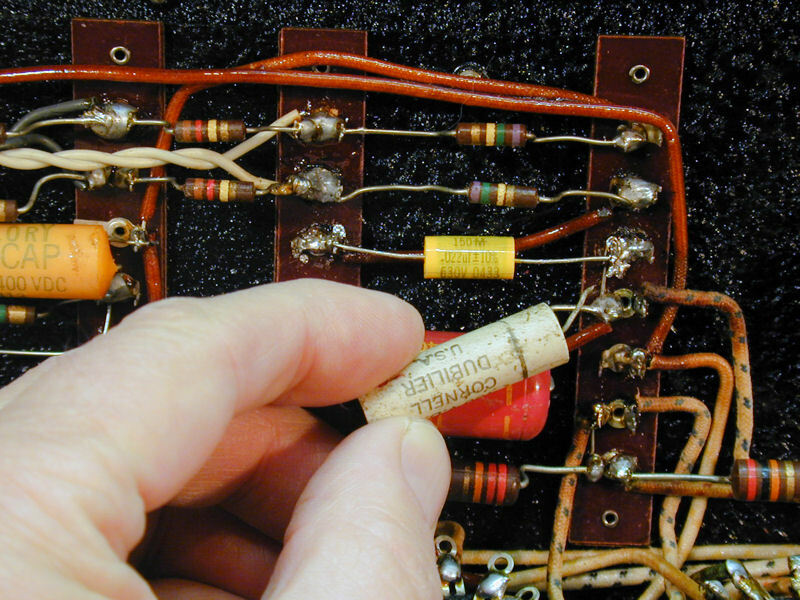 Components are neatly arranged on phenolic terminal boards and their connections are readily accessible, rather than buried under other components and wires. 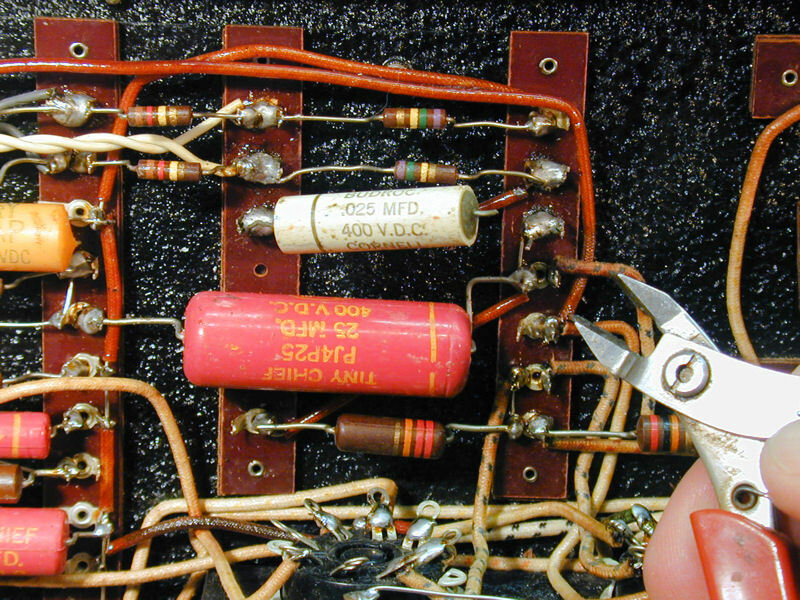 We'll begin by replacing the capacitor shown in the next photo. It's likely a replacement, installed during past service. These white tubular caps were no better than the pink Tiny Chiefs, so I'll replace it even though it may be a few years newer. The old capacitor's value is .025 mfd. The schematic calls for .020 mfd. I'll replace it with the modern value, .022 mfd. A difference of .002 from the specified value will not matter. Most old components were manufactured within a tolerance of 20% above or below the nominal value, so a difference of .002, or 2%, is well within the needed value range. 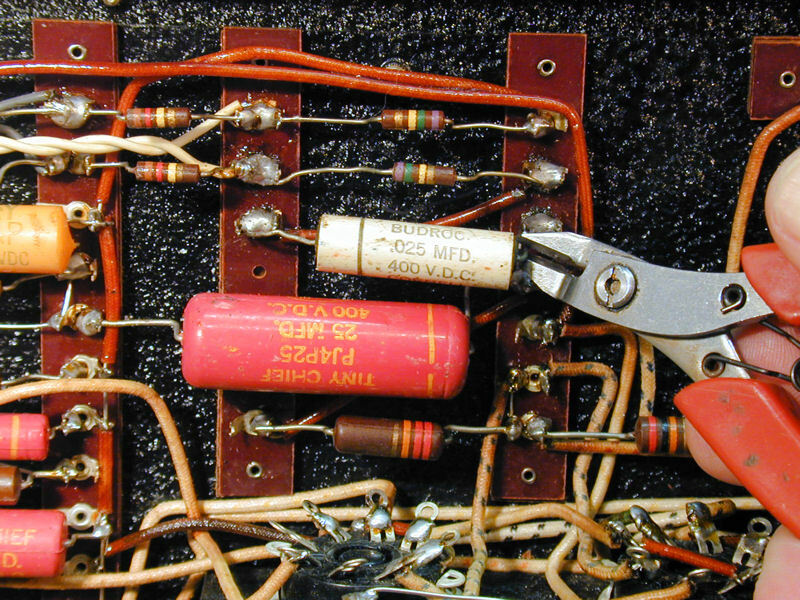 I carefully note where the capacitor is connected and then snip each end. Then I can melt the solder on each terminal and remove the wire stubs with a plier. This is easier than trying to work the wire loose from the terminal while the capacitor is still connected, which can damage the terminal if you yank too hard. 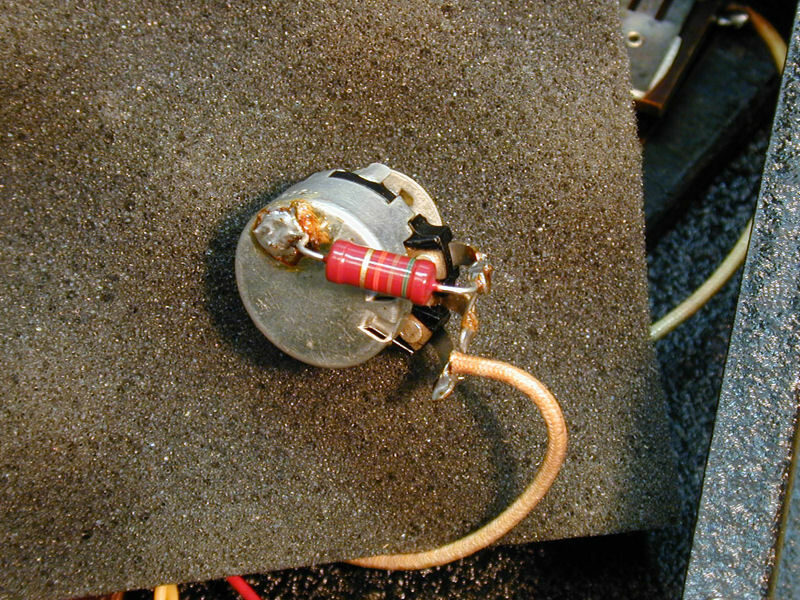 After I remove the first wire stub, I reheat the joint and remove excess solder with the solder sucker. I repeat the process on the second terminal. The new capacitor is smaller than the original and it will easily fit the space. I snip its ends and bend them to fit neatly around the terminals. If a terminal has holes (these don't), you can run the new capacitor's lead through the hole and bend it around the terminal a bit, before snipping to length and crimping. 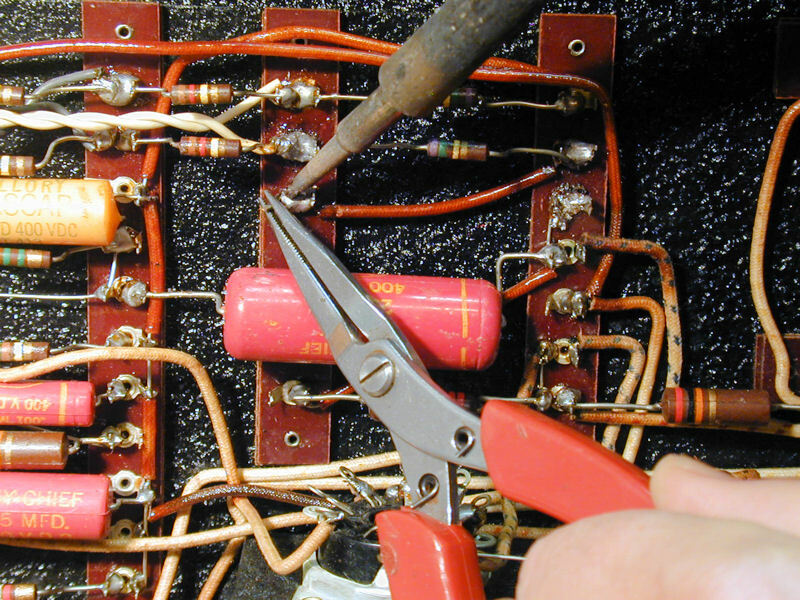 Next, I crimp the pre-formed wire ends onto the terminals and secure them with new solder. 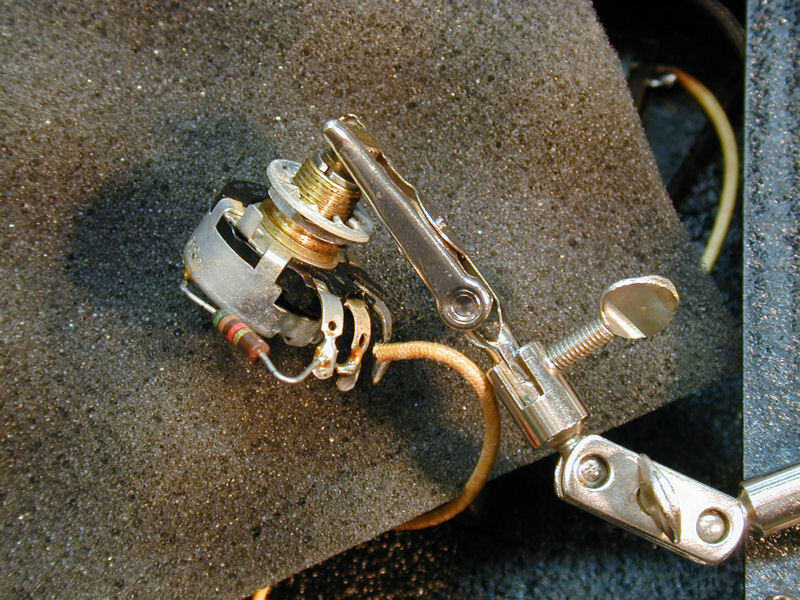 Always heat the joint first and then apply the solder to the heated joint rather than to the hot iron. This distributes melted solder evenly throughout the joint. 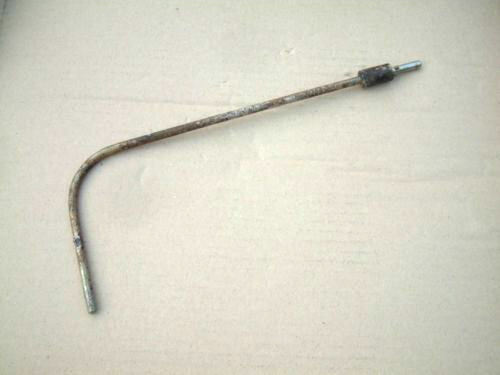 It is very bad practice to melt solder on the iron and let that drip onto a cold joint. Sometimes, when a delicate component is connected to a terminal, I'll temporarily clip a metal tweezer onto that component's lead, to act as a heat sink and prevent overheating damage. That's not necessary in this case, since I'm working quickly and heating the joint only long enough to flow the solder into and around the joint. We have replaced one capacitor. Only a few dozen more components to go! Replacing the remaining capacitors was simply more of the same. 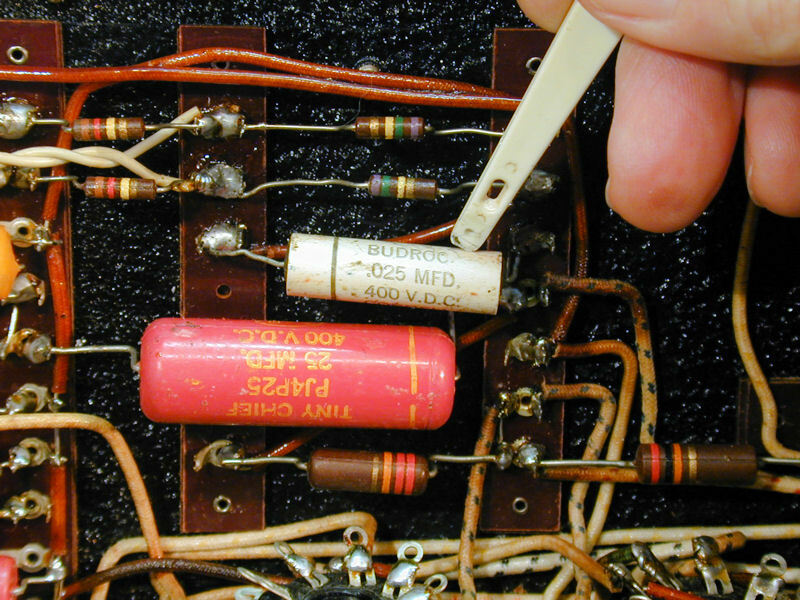 The process looks laborious when you document every step, but with practice, you'll be able to replace a capacitor in only a minute or two. 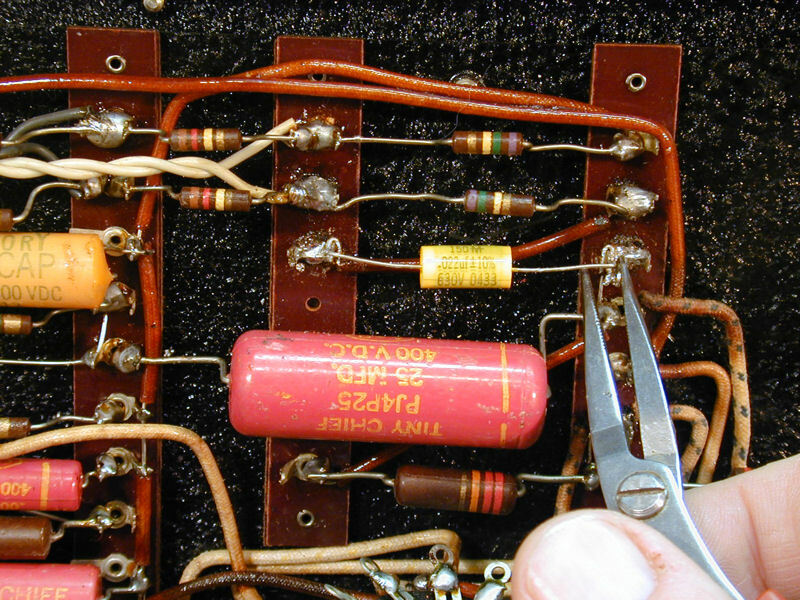 In a typical radio or TV restoration, I leave all or most of the original resistors in place. 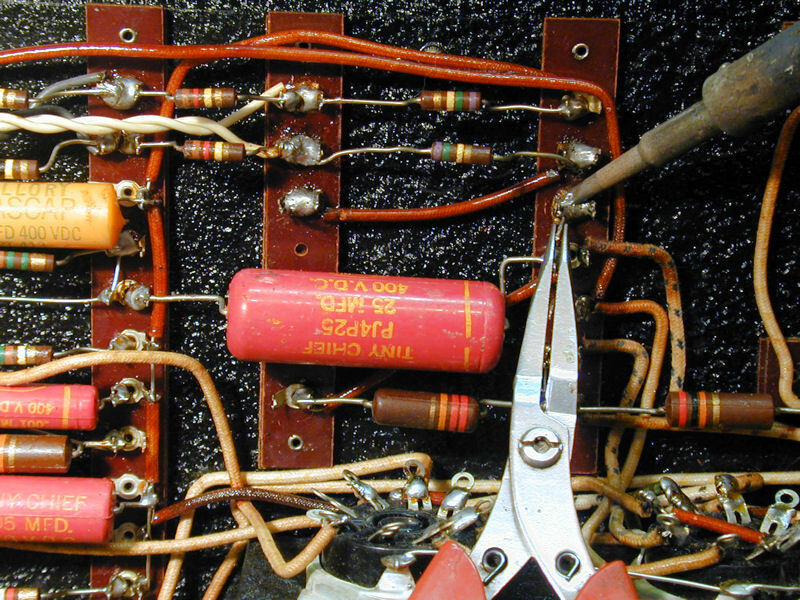 Resistors are more reliable than capacitors and in many cases their precise value isn't critical in the first place. 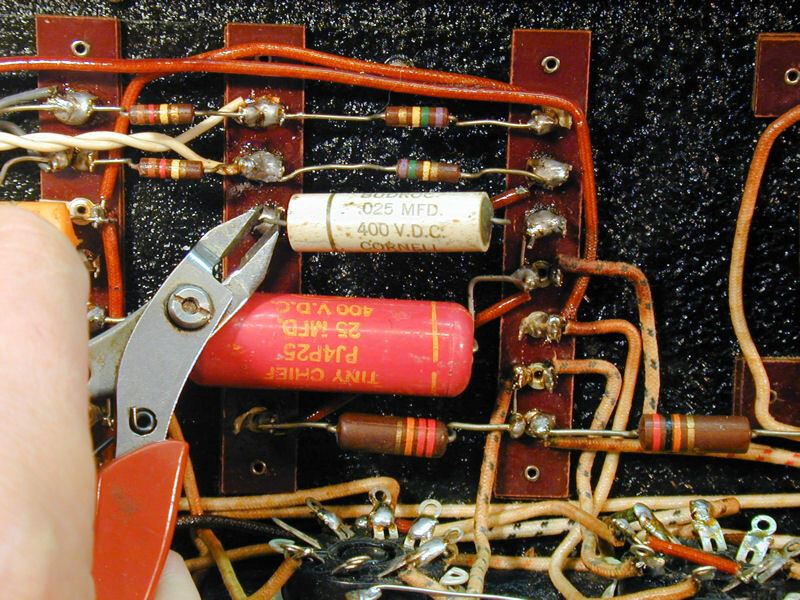 Unless otherwise specified, resistors in old tube devices are expected to be within 20% of their nominal value, and in many cases a radio or TV will work normally even if a resistor's value has drifted beyond that range. 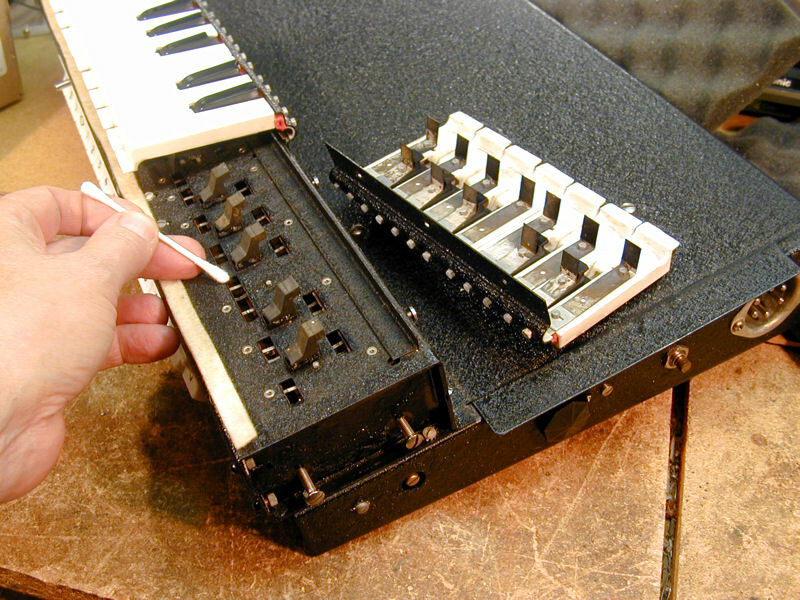 The Clavioline is a musical instrument, however, with circuits intended to oscillate at particular frequencies. The resistors in its keyboard chain are of extremely high precision and stability, and they have unusual values relating to musical frequencies, such as 6300 ohms, 6670 ohms, 7074 ohms, and so on. The high-precision keyboard chain resistors seem to be fine—each key is in tune relative to the others—and so I won't touch them. Most of the other resistors are of the everyday carbon variety, however. I'll replace those as long as I have the chassis on the workbench. 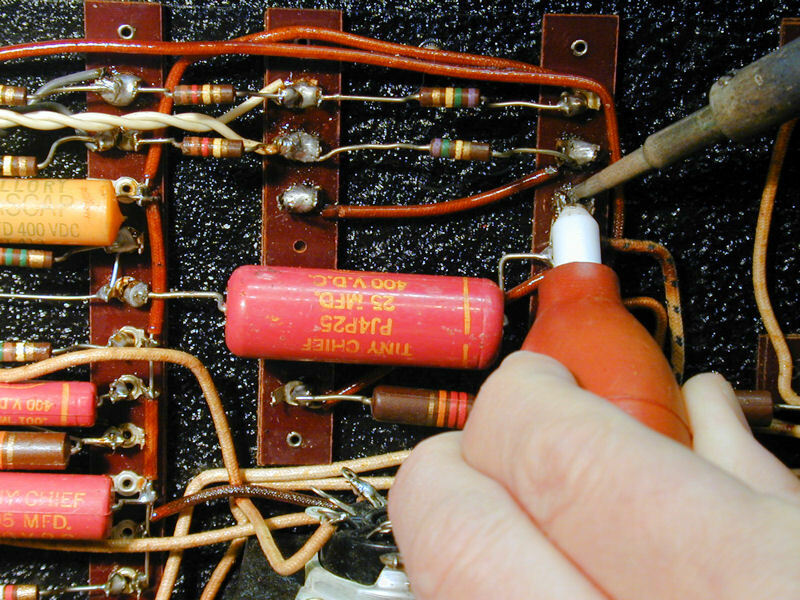 Replacing resistors on the terminal boards is the same as replacing capacitors there. Remove the old resistor and solder in the new one. Replacing this resistor is easier if you first unscrew the potentiometer from the keyboard frame, as shown in the previous photo. While I have the potentiometer out, it's a good time to clean its interior using DeOxit or a similar electronic cleaner. 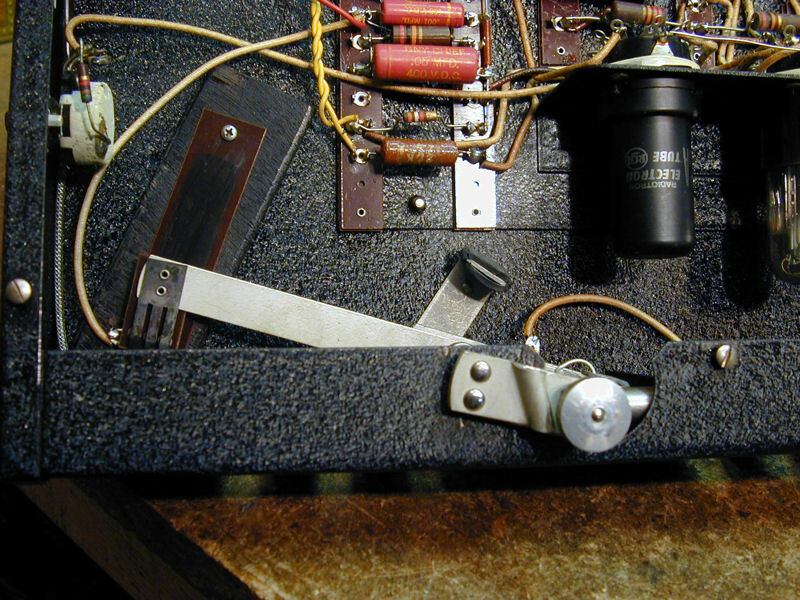 In the previous photo, notice the little opening in the potentiometer case near the terminals. Spritz a tiny amount of cleaner into that opening and then turn the potentiometer all the way back and forth a number of times, to distribute the cleaner. Dab up any excess cleaner that drips out of the case and let the Clavioline sit overnight before you apply power again, to make sure the cleaner has evaporated completely. I cleaned the other carbon type potentiometers in the same way. 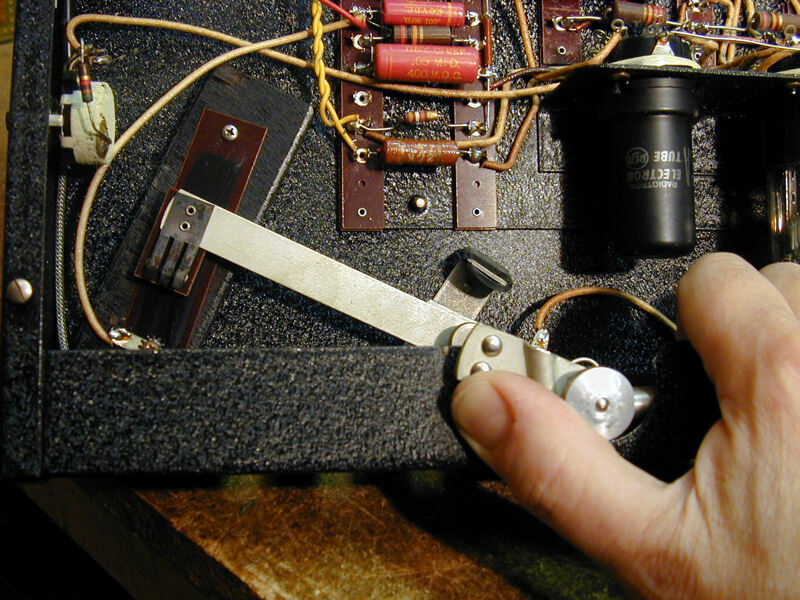 The larger potentiometers (without openings in the case) are the wire-wound type, which normally requires no cleaning. The knee-operated volume control has a different type of potentiometer. The rotary type shown earlier has a metal wiper inside, which moves in an arc around a resistive carbon track, producing lower or higher resistance as you turn its shaft. The potentiometer shown next also uses a metal wiper on a resistive carbon track. However, the track is a rectangle on a flat phenolic board and the wiper moves back and forth in a straight line (actually, a very shallow arc) on the board. Here's a little animated GIF that show the control's operation more clearly. My volume control worked perfectly without cleaning, so I left it alone. If you wanted to clean it for some reason, I would be careful not to rub the resistive track too hard, lest you wear it off and ruin the potentiometer. When the Clavioline is reassembled, a long, L-shaped lever is mounted on this volume control, so that you can move it with your knee. All told, I replaced about 50 capacitors and resistors in this chassis, in addition to cleaning the keyswitches, control switches, and potentiometers. 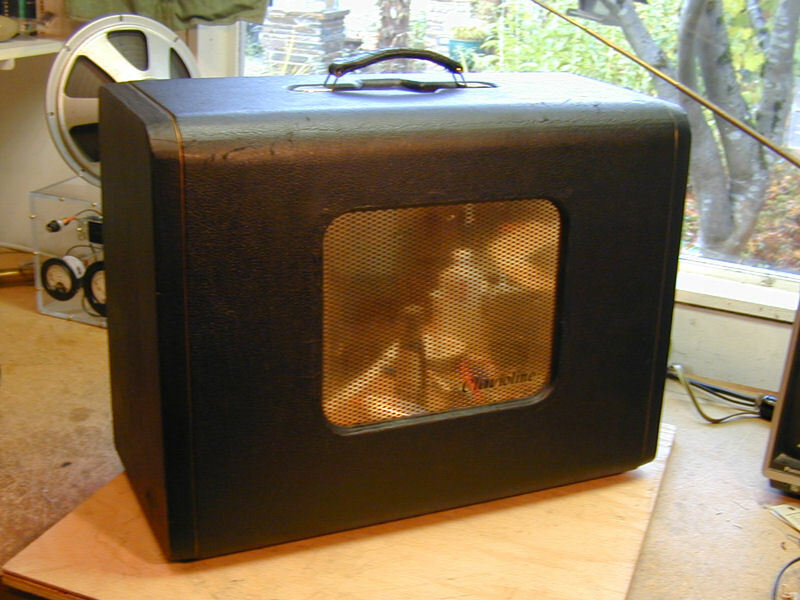 The second Clavioline chassis contains circuits for the power supply and audio amplifier. 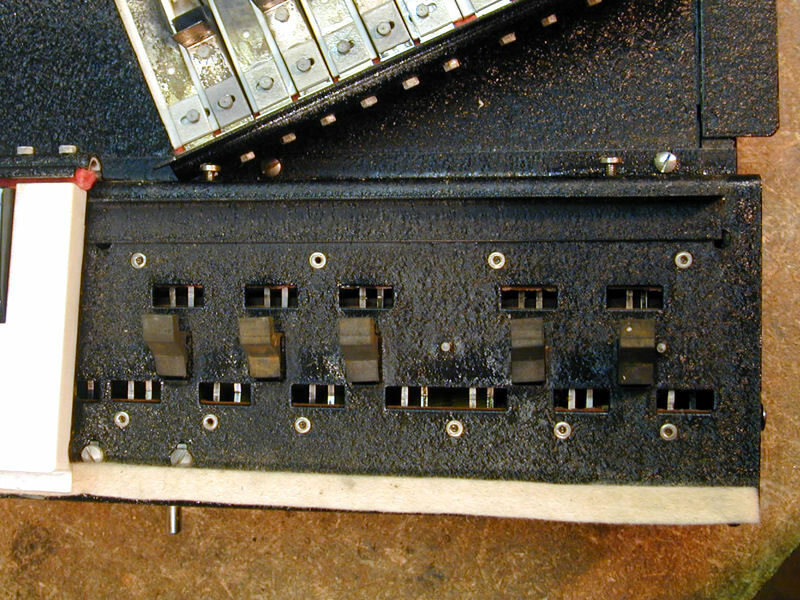 This chassis is far simpler than the keyboard chassis and its restoration was straightforward. Again, in the interests of reliability and longevity, I replaced its resistors as well as the electrolytic and paper capacitors. Two of the electrolytics are multi-section cans mounted upright on the chassis. I left the cans in place above the chassis, but disconnected their contents and wired new capacitors underneath. You can read about several alternative methods for replacing electrolytic cans in my recapping article. 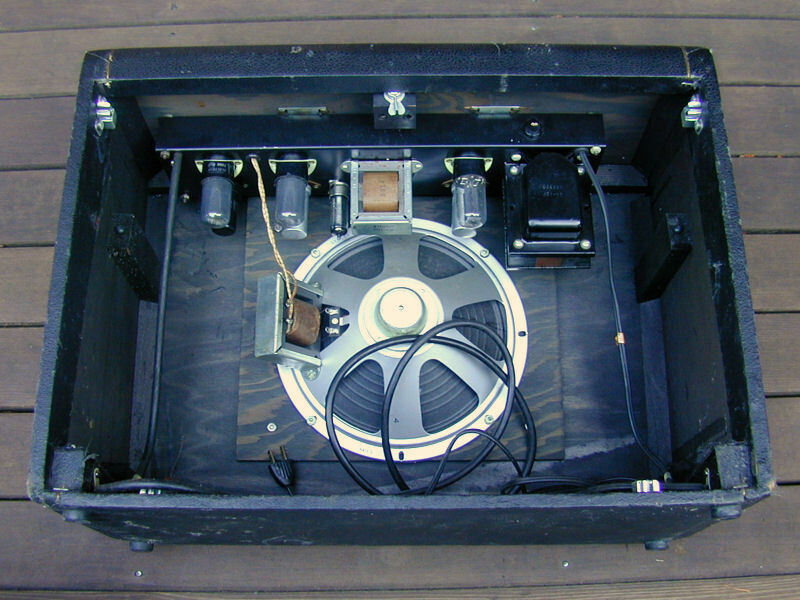 As you may recall from earlier photos, this chassis mounts upside down inside the speaker cabinet. Its power switch and green pilot light protrude through an opening below the cabinet's handle. The Clavioline cabinet is covered with leatherette, a vinyl-coated fabric. 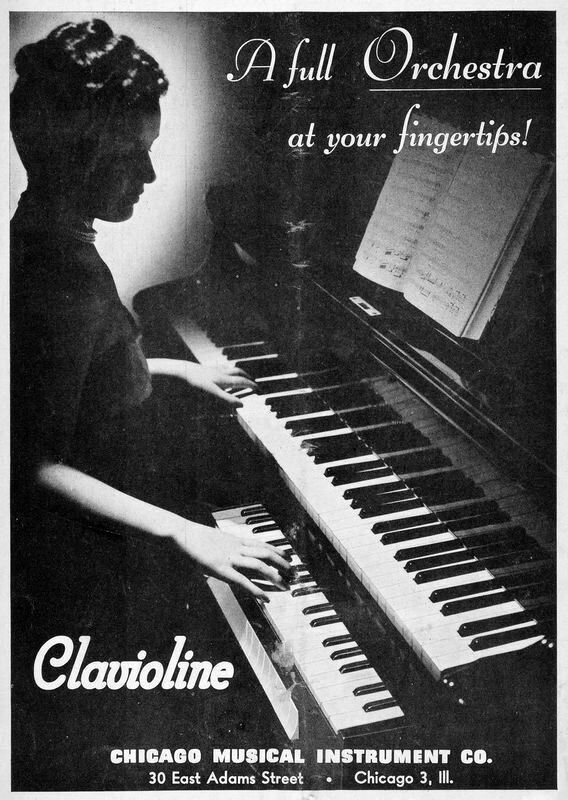 When I first got my Clavioline, it had a tear in the front near the speaker grille, and assorted scuffs and scratches. The first step was to clean the covering with Windex and reglue the flaps of turn fabric. Next, I used black liquid shoe dye to conceal the scratches and give the covering a uniform color. In the following photo, I have begun by coloring the strips along the sides. 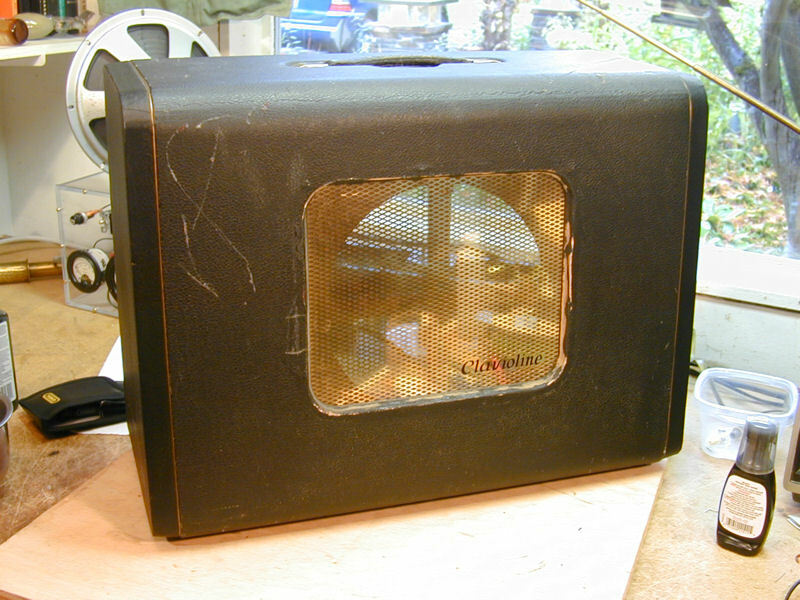 Notice the narrow band of exposed plywood around the speaker opening. Perhaps this was originally covered with a thin strip of leatherette, which fell off. I don't have leatherette on hand, but at least I can color the bare wood black so that it doesn't attract attention. After coloring the whole cabinet, it looks much better. You can still see some marks of age, but I wouldn't be embarrassed to bring the instrument onstage. For this photo, I mounted the Clavioline on an old, heavy-duty camera tripod. I assume that the original tripods were similar, based on pictures in the magazine ads, perhaps with a wider bracket at the top to steady the heavy keyboard against pushing on its ends. Of course, in a performance setting the speaker would be aimed outward at the audience, not perched in front of the keyboard as in this photo. The connecting cable is long enough to place the speaker alongside the keyboard. I haven't yet had time to try out all of the Clavioline's different voice settings, much less compare its performance to my Solovox. 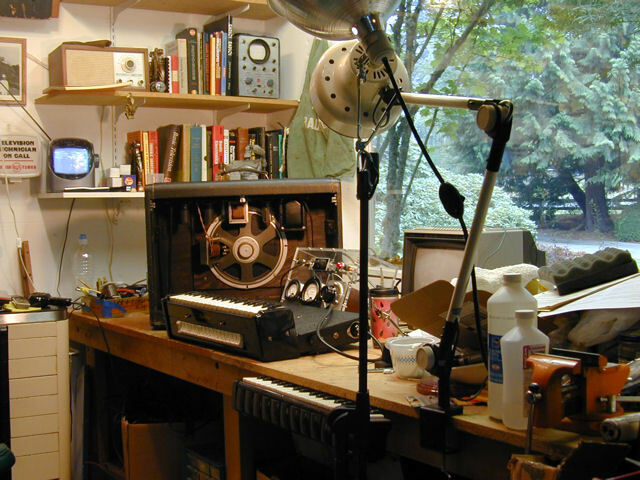 Perhaps when my son comes home for the holidays, we can set up both instruments side by side for comparison, and even record a couple of audio clips to add to this article. I'm seeking a few minor items. My Clavioline is missing the rightmost control key, labeled P. If you have any spare key for sale, I'd be interested in that. A working key with a different label would be better than no key at all. Lastly, as noted earlier, I'd like to find a complete Gibson service manual, as well as an owner's manual. If you have any or all of these items, kindly contact me.